The modernist "Twelve" line from Issey Miyake was designed by Naoto Fukasawa, known for his innovative groundbreaking creations and approach to design. 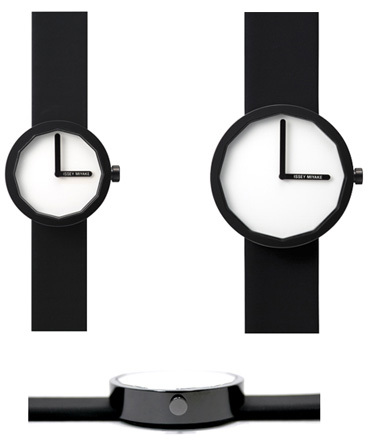 "I tried to design a watch which is simple and as strong as possible. I wanted to eliminate all marking, even numbers, from the face. This inspired me to give the crystal itself twelve sides. With the twelve angles of the case serving as the hour markers, I only had to add the hour and minute hands, both having the same width equal to the diameter of the central post. The result is a sharp face distinguished by the unique angular shape and wide hands. I feel that this strong, clean and simple design is suitable for the brand of Issey Miyake".